This is a nicely furnished studio condo on the third floor at Jomtien Beach Condominium A3, within a very short walking distance of Jomtien Beach. The apartment consists of open plan accommodation including living, kitchen and sleeping areas with a separate bathroom and a balcony. The modern kitchen is fully equipped with cooking utensils, crockery and cutlery, plus an electric hob, toaster, hot water kettle, microwave and refrigerator. The main living area contains a double bed, storage facilities including a wardrobe, dressing table and display units; along with a sofa, a coffee table, a desk and chair and a flat screen TV and DVD player. There is also access to the balcony via large sliding doors. The modern bathroom is fully tiled and includes a glass basin unit, storage facilities and a large walk in shower. There is also a balcony, which includes balcony furniture and provides a lovely place to relax. The apartment has the additional benefit of tiled flooring throughout, down-lighting, curtains and air conditioning. Residents at Jomtien Beach Condominium have the benefit of some fantastic facilities and amenities here, including parking, free use of bicycles, a club house with a fitness center and table tennis room, a large swimming pool with a children's pool and 24 hour security. There is also WiFi available (on a pay-as-you-go basis) and a range of laundry services, shops, bars, restaurants, massage parlors and beauty salons at this well maintained condominium. Jomtien Beach Condominium is in the popular area of Jomtien; whilst this is a quieter beach area than neighboring Pattaya, the area also offers a large variety of activities and amenities for the whole family to enjoy. As well as the 6 km long sandy beach, there are numerous bars, restaurants offering both local and international cuisines, cabaret and entertainment venues, a range of shops, fresh food markets and 2 fantastic night markets, plus a variety of water-sports to be found along the beach. Central Pattaya with its many amenities and attractions is easily accessible, being a just a short drive or Baht Bus ride away. 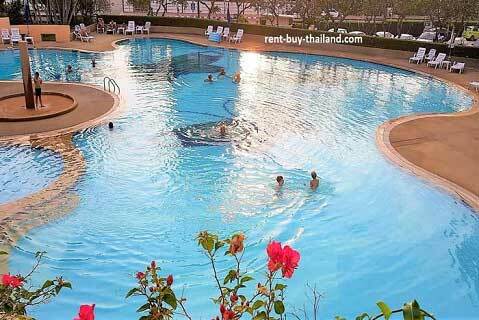 Rent to Buy a condo Jomtien – Easy payment plans available, no credit check needed supplying you with affordable accommodation. Other condos around the area are available, please inquire for further details.